In the previous lesson, we learned the notes on a guitar. This lesson will show you a productive way to cement this knowledge in your mind and, at the same time, get you thinking about note patterns. What do I mean by patterns? Basically, a formation of related positions on the neck. These relationships can be visualized (and memorized) as movable units and will help you find your bearings quickly, no matter where you are on the neck. The below video takes this concept to its logical conclusion. Concentrate more on the first part of this video on note patterns. The other stuff can be clarified later! In a moment we'll look at some fretboard diagrams to see how the six strings relate to each other. Assuming you've learned the notes on the lowest two strings, this shouldn't take too long to master, and what you end up with is the ability to shift these visual relationships (patterns) up and down the neck. We established in earlier lessons that, at any given fret, the 1st string is the same note as the 6th string. So if you were at the 2nd fret, for example, you should know that the 6th string would be the note F♯, therefore the high E string at the 2nd fret would also be the note F♯. Right away then, if you've learned the 6th string notes, you'll automatically know the 1st string notes. The other related string in that diagram is the 4th string. Look at its position in relation to the 1st and 6th string - it's two frets higher. So if you fretted the 4th string at the 4th fret it would be the note F♯ because the 1st/6th string in their related position would be at the 2nd fret, which you'd know is also F♯. 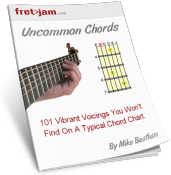 Try it - play that pattern above anywhere on the fretboard. As long as you keep that formation of notes, they're the same note. Once again, look at the visual relationship between those three strings - they're all the same note. The 2nd string note is two frets below the same note on the 5th string and four frets below the same note on the 3rd string. This diagram links the previous diagrams together. Can you see where? Again, all the same note. The note positions on the 1st, 4th and 6th strings we learned from the first diagram in this lesson. The 2nd string position we learned from the second diagram, so we're in effect linking those first two diagrams together. The link between the two patterns is made between the 2nd string and 4th string positions - they're three frets apart. Notice anything familiar in the diagram above? Namely the relationship between the 3rd and 5th strings and the 1st and 6th strings? We've just linked these together. The 3rd string position lies three frets below the 1st and 6th string positions. Then, once you know the note on the 3rd string, you also know how the 5th string relates to that from the second diagram! You can hopefully pick out those patterns we've looked at. It's just a case of linking them together and practicing until you can move between the positions almost without thinking. It won't take long to get to that stage - start with 10 minutes a day, choosing a different note every day. So What's the Real Benefit of All This? Well, for a start, being able to locate the same note on multiple strings instantly frees up your playing. You'll be able to jump to different parts of the fretboard for any note without guess work. For example, you might think "I need a higher sounding B note" or a "lower sounding 3rd" (you'll know what "a 3rd" is soon enough!). The patterns we've learned here will give you those signposts. It's one of those skills you grow to appreciate the more you progress. Thanks for your patience!